Today is the feast of St Norbert, the founder of the Order of Canons Regular of Prémontré, who died on this day in the year 1134. Religious orders have traditionally kept a variety of secondary feasts of their major Saints, and the Premonstratensians were no exception. Since June 6th often occurs within the octaves of Pentecost or Corpus Christi, for a time it was relegated in their liturgical books to a “Commemoration” of their founder’s death, and a “Solemnity of St Norbert” was instituted on July 11th, so the feast could more conveniently be kept with an octave, as was customary for all major Patron Saints. (This was also done by the Benedictines on the same day.) 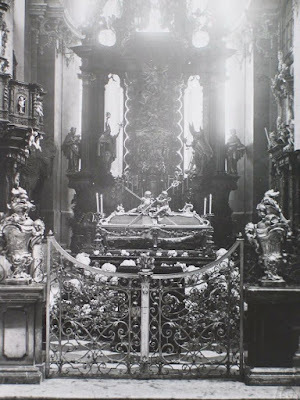 There was also a feast on May 7th of the translation of his relics, which were taken in 1627 from the cathedral of his episcopal see of Magdeburg, which had turned Protestant quite early on, to Strahov Abbey in Prague, where they remain to this day. The shrine of St Norbert at Strahov Abbey, from this post of 2016. Another of these secondary feasts is called “the Triumph of St Norbert”, commemorating his defeat of a particularly bizarre heresy in the Low Countries, especially in the area of Antwerp. Norbert was a great promoter of Eucharistic devotion, one of the characteristic features of his order, well over a century before Pope Urban IV promulgated the feast of Corpus Christi. As recounted in the Premonstratensian Breviary, Tanchelm, “a most wicked man and enemy of the whole Christian faith, and of all religion”, denied any value or purpose to the Blessed Sacrament, and had somehow succeeded in convincing his fanatical followers to worship himself, and venerate his bathwater as a relic. The local clergy, unable to make any headway against the sect, consigned one of their churches to the newly founded order of canons regular; St Norbert and his brethren completely defeated the heresy solely by the force of their preaching. 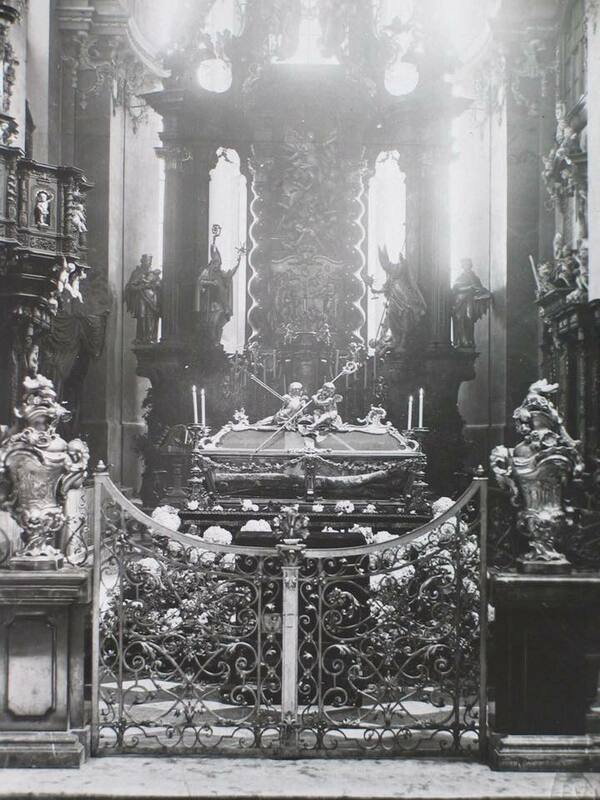 Faithful Catholics who had managed to hide the Sacrament and sacred vessels from profanation, keeping them hidden in some cases for several years, brought them back to St Norbert, who restored to them to the churches. 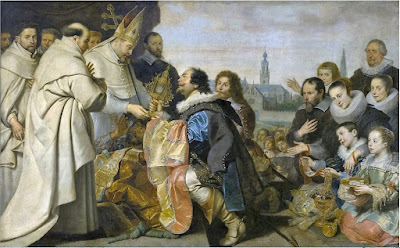 In the early 17th century, the same Abbot of Prémontré who presided over the translation of St Norbert’s relics, Pierre Gosset, granted the celebration of this feast to the province of the Order which included the Low Countries. It was extended to the entire Order by Pope Leo XIII, and originally assigned to the 3rd Sunday after Pentecost, then moved back a day after St Pius X’s Breviary reform. The Office for this feast is identical to that of Corpus Christi, except for the lessons of the second nocturn, which recount the story of the heresy’s defeat. A commemoration of St Norbert is added to both Vespers and Lauds; at the latter, the antiphon is taken from his principal feast. Aña Antverpienses, Tanchelmi haeresi sacramentaria dementatos, verbo Dei sane propinato, ad fidei Catholicae communionem reduxit. - By soundly preaching the word of God, he brought the citizens of Antwerp, who had been driven mad by Tanchelm’s heresy on the Sacrament, back to the communion of the Catholic Faith.